After last night’s less-than-thrilling Superbowl victory, a lot of people are collecting their winnings, or paying up on some of the bets they made today. The Superbowl is one of the most heavily wagered sporting events in the world. Everything about the game can be bet on from the final score to how long the national anthem will run, to the coin toss, and even odds as to whether the fly-past will be precise or out of sync. Americans bet close to $5 billion on the various outcomes at the Superbowl. Some feel it makes the event more exciting. For Michelle James, the last two minutes of the game must have been very tense. She had already won the end of the third quarter prize in our Superpool, as the clock hit 1:12 seconds left in the game, a 41-yard field goal by Stephen Gostkowski to make the game 13-3 now put Michelle into contention to win the GRAND PRIZE (both Team’s scores ending with a 3) and a chance at winning the Samsung 65″ 4K ultra high definition TV and Soundbar in the ROCK 95 2019 Superpool. It would have been great to be at her place when that field goal was made to bring the score to 13-3 and then after the Rams failed on their last seconds chance at a field goal, it became clear that the final score would stand at 13-3 which made her the Grand Prize winner in the Super Pool contest! 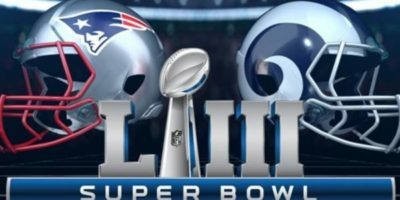 Thanks to Simcoe Audio Video for providing the TV that made the contest so much fun, and thanks to everyone who took part to help make an otherwise fairly dull Superbowl game into one of the most exciting finishes for our contest players.